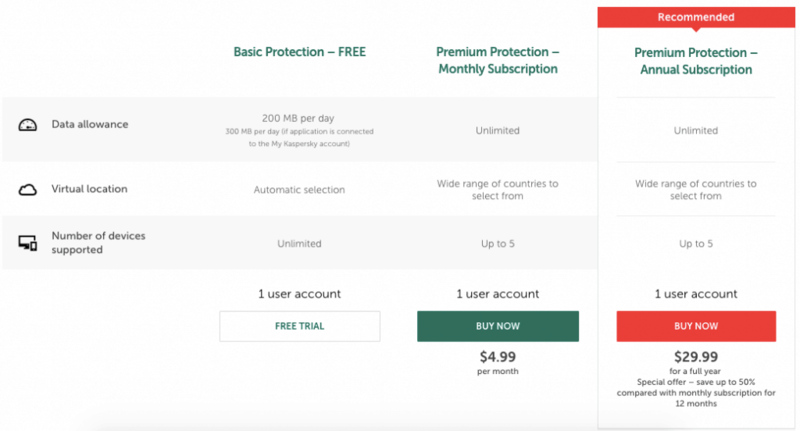 Kaspersky Secure Connection Review - Russian VPN, Worth It? Kaspersky Secure Connection comes from Russian security company, AO Kaspersky Lab. The firm was founded in 1997 and offers a suite of related products that reach over 400 million users and are supported by over 3,000 employees. These tools range to everything for home and individual use, on up to securing massive corporate networks. But we’ve been here before. Too much of a good thing can definitely be a bad thing. Does Kaspersky spread itself too thin? Or does their massive resources help them provide a superior VPN offering? 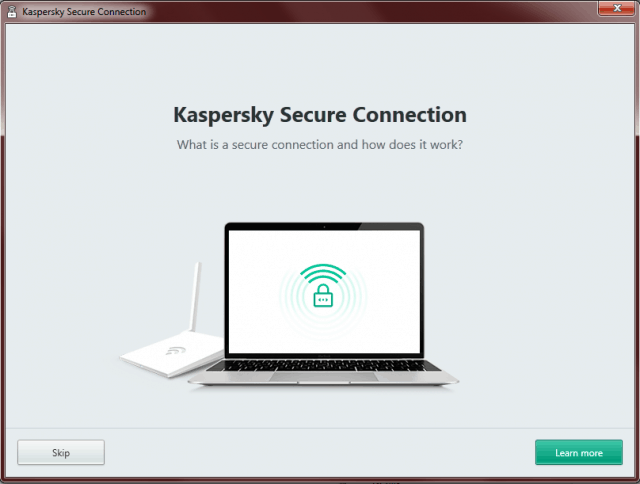 We’ll answer those questions and more by the end of this Kaspersky Secure Connection VPN review. Kaspersky Secure Connection provides a plethora of protocols to choose from, along with the most up-to-date encryption standard. That results in a locked-down connection that doesn’t leak your location. 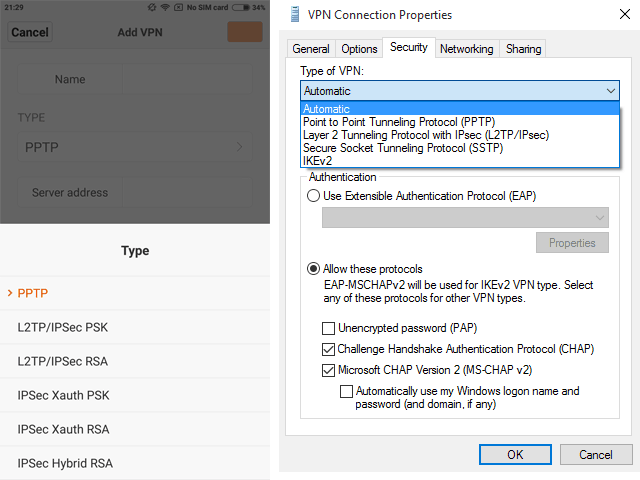 Kaspersky Secure Connection defaults you to the industry-standard OpenVPN and AES-256 encryption. Both are bank-grade and virtually impregnable by outside forces. They’ll take care of 98% of the users out there. But for the remaining 2% running on outdated networks or devices, you’re in luck. Because Kaspersky also offers PPTP, L2TP/IPsec, SSTP, and IKEv2 protocols. So you’re pretty much covered anywhere you turn. Switching these is also simple. All it takes is the flip of a switch inside each app. Kaspersky’s good vibes continued when we ran their connection through several leak tests. All of your Internet traffic music pass through a DNS server. This is where everything from who you are to where you’re going gets recorded. Typically, these DNS servers will belong to your Internet Service Provider (ISP). And many times they’ll either hand over this data to the government or even sell it to other companies for marketing purposes. Unless, you’re using a VPN that’s rerouting your traffic, first. That way, your ISP (or anyone else for that matter) can’t record all of your online activities. Except for when your data starts to leak through the connection. In this case, all of your personal info does make it out to each party. All while you’re none the wiser. You’re A-OK with Kaspersky, though. Next up, we ran their installation files through VirusTotal.com to make sure everything about their software was on the up and up. Zero out of 65 potential red flags were raised. So that appears to be the case. Kaspersky Secure Connection started well. Unfortunately, they ended not so well. Despite a promising start, we ran into a bunch of hang ups while trying to actually use the service. Here’s a roundup of the biggest flaws to keep in mind. Most VPNs will keep aggregate log data to monitor service usage and try to improve performance over time. So that “no logging” website claim is often of a myth. That very last bullet admits they’ll turn over your personal identify if a “violation” occurs. And more importantly, what exactly constitutes a “violation”? The first answer is somewhat obvious. While the second is kinda answered in the first bullet above. It doesn’t seem like there’s anything in this on the surface. But here’s why we’re hesitant. AO Kaspersky Lab is based in Russia. Initially, that’s good! They’re outside the Eyes intelligence alliance, which means your data (if collected) wouldn’t be shared across North America, Europe, and Oceania. Leaked documents have revealed that these countries often help spy on each other’s citizens, sidestepping local laws that would otherwise prevent the oversight. Then, they simply share those resources to get what they’re after. Russia is not a part of any known intelligence sharing agreements like this. But they have their own issues. Starting with the fact that Russia only allows government-approved VPNs. They basically censor the Internet, except dress it up in other colorful language. And the authoritarian regime can basically decide whatever it wants, whenever it wants — whether you like it or not. Take the recent case of Telegram. They’re an online messaging server with about 15 million users in Russia. The Economist reveals that businesses and journalists love it’s anonymous channel feature to be able to freely share information. Except, the government doesn’t like that. And they’re now coming for a pound of flesh. They demanded that the company hand over cipher keys so they could access these anonymous conversations. Telegram refused and tried to fight charges. Guess who the courts sided with? Not only are they going to block the service, but they’re also trying to funnel users over to a government-friendly alternative. Does that sound like a jurisdiction concerned with its citizens privacy? Kaspersky has native apps for Windows, Mac, Android, and iOS devices. That means no messy config files to deal with! You can connect up to five simultaneous devices on their paid plans, too. Unfortunately, that’s also where the good news ends. Kaspersky does not support routers, smart TVs, gaming consoles, or even Tor. Torrenting isn’t so cut and dry. They don’t necessarily deny it anywhere. However, they do state that ISPs and local laws supersede torrenting restrictions. And they specifically warn people from violating copyright laws in their Terms of Service. So torrenting is largely frowned upon. There is also no kill switch on their VPN apps to help prevent exposure of your browsing data when a connection drops. Kaspersky Secure Connection’s server speeds ranked 41st out of 78 different VPNs. This rank comes from measuring the performance of multiple servers speeds and compiling the data. First, we used Speed Test to find our baseline download and upload speeds. We got 97 Mbps down and 53 Mbps up. Not great, but not too bad. Especially considering there was a lot of distance between our physical location and this particular server. The next step is to connect to another server, this time in the EU. The results weren’t much better, to be honest. Finally, we add up these combined results and compare them to all of the other speed tests we’ve run. Kaspersky’s middling performance from both servers weren’t good enough to crack the top half of the table. If you need a faster VPN, take a look at our 7 fastest VPNs here. We tried streaming Netflix while connected to four different Kaspersky servers. Interestingly, we even found evidence that using a server in a user’s own country still won’t work. So you’re pretty much screwed either way. Netflix has successfully shut down Kaspersky servers. And it doesn’t seem like the company cares about trying to change that anytime soon. Check out our list of the best VPNs for Netflix for some alternatives. 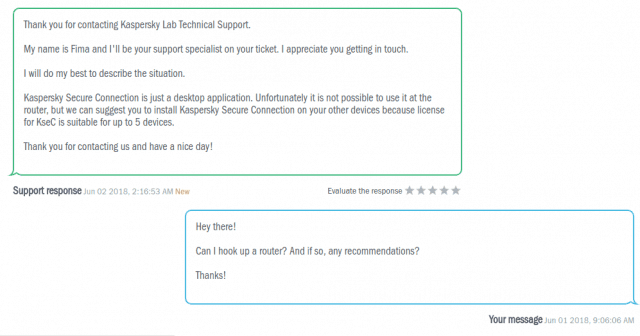 Kaspersky doesn’t offer a simple live chat or email support option. They do have a thorough knowledgebase, but you’ll have to log into their My Kaspersky account site to access any support options. The experience is also cumbersome because there are so many other competing VPN services. So you can’t just get a VPN-specific option. Instead, you have to sift through literally dozens of options to find the right product. Then, if you want to create a support ticket, you have to fill out tons of extra details. This includes questions about your specific issue, license key number, device, app version, and even operating system. You finally fill out your support ticket, hit “Send,” and then wait. They talk about having over 3,000 employees. They list over 30+ offices worldwide. Their site will geolocate to send you to the appropriate country’s site (complete with that country’s local office and contact information). So… where are all the support reps?! It took hours to answer a simple query during normal business hours. 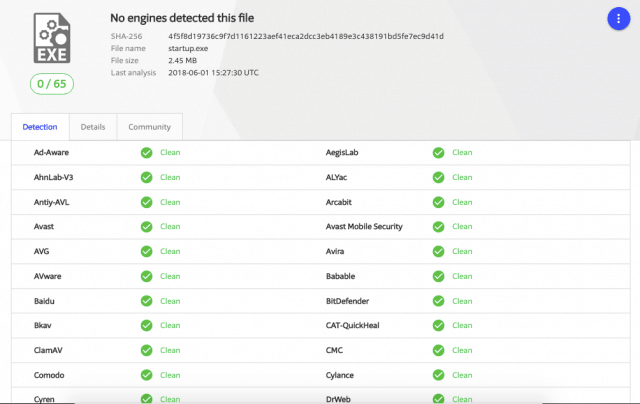 Getting started with Kaspersky is pretty easy, assuming you’re using their pre-built clients. Pretty smooth sailing so far. There’s even a little intro tutorial if you’re new to the world of VPNs. But a few quirks starting popping up when it came time to actually use the service. First, if you tried out the free version, you need to uninstall it before downloading a new app for the paid version. You also need to restart to get things up and running. Kinda a headache, but not a deal breaker. This next one might be, though. When we were testing servers and running leak tests, we noticed conflicting server data. If you remember, no leak tests came back positive. That means the connection wasn’t leaking at all. 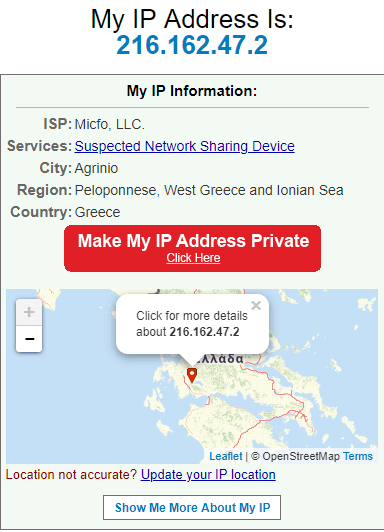 Yet, the app told us we were connected to a Netherlands server, even though whatsmyip.com showed the server was actually located in Greece. There could be two explanations for this. The first is a simple bug or mistake. They could just have a glitch or oversight in the system that’s mislabeling servers. The second answer could be that they’re lying about fake VPN servers. That might sound crazy, but it happens all the time. 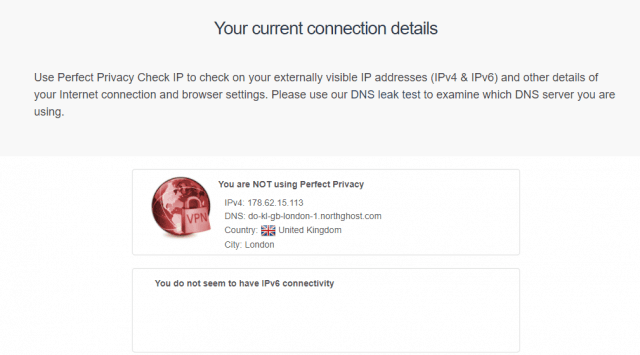 VPN companies will lie about server locations to help overstate their network coverage. Generally speaking, the more servers the better. So it puffs up their numbers a bit. And most users would have no idea, as long as they put you on a server that’s close to the intended destination. Either way — buggy or deceptions — neither is positive. Let’s piggyback on that last point for a second. You should notice a few things missing. They only show countries, not cities or locations. Does that mean there is just one server location in all of the U.S., for example? That’ll force people from a massive area to travel far and connect to the same overcrowded server. And there are many large continents underrepresented in that list. Three in Asia, zero in Africa, the Middle East, Oceania, and South America. These people will have to connect to servers on the other side of the world in some cases. Here’s another weird quirk we noticed. Many of these countries have the same government-specific laws or regulations. However, I see Hong Kong on that list. And I saw Hong Kong above on the Windows drop down. So you can’t live in those locations and use the service, but you can live elsewhere and connect to a server there? Not only are these issues odd. But it also means that Kaspersky probably won’t work well for like half the globe’s population. The first is a restricted, free trial account. You’re only allowed 200-300MB of data each day, which you’ll probably exhaust pretty quickly. The second is a monthly option starting at only $4.99 per month. That’s a great deal considering most monthly VPN options are closer to $7-9/month. But the best deal is saved for last. The annual plan will set you back only $29.99/year. That’s probably one of the cheapest promotions we’ve seen. Just keep in mind that this is the low introductory price for new people and that renewal fees can often jump in subsequent years. Kaspersky will accept all MasterCard, Visa, American Express, and Discover cards. Or you can pay with PayPal. No cash or cryptocurrencies are accepted at this time. As with every Kaspersky Lab product, there is a 30 days money-back guarantee. The free trial also doesn’t seem to have any time limitations, either. (Beyond the data restriction.) So you can use that until you’re ready to give up or move forward. Do I Recommend Kaspersky Secure Connection? 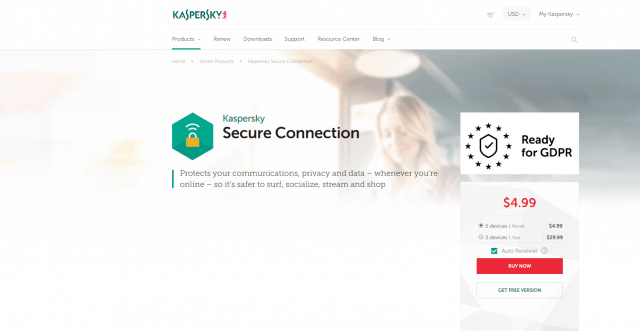 Kaspersky Secure Connection seems like a decent bare-bones VPN. But there are just too many problems for us to recommend. The logging policy and jurisdiction cause some hesitancy. They don’t really work well beyond the basic devices or platforms. Netflix, tor, and torrenting all don’t really work, either. Speeds were slow, support was slow, and country servers were too low (or buggy, or fake). There are just too many other good VPN options out there to recommend Kaspersky. I have used this product for over a year and it has done very well. I have noticed the signal NEVER drops if you log in to a website. I did find that you have to restart the connection every 4 hours because the signal would get slow. All you have to do to fix this is restart the connection or log on to another Country server in the program. I have tried many VPN’s and this is one of the best.